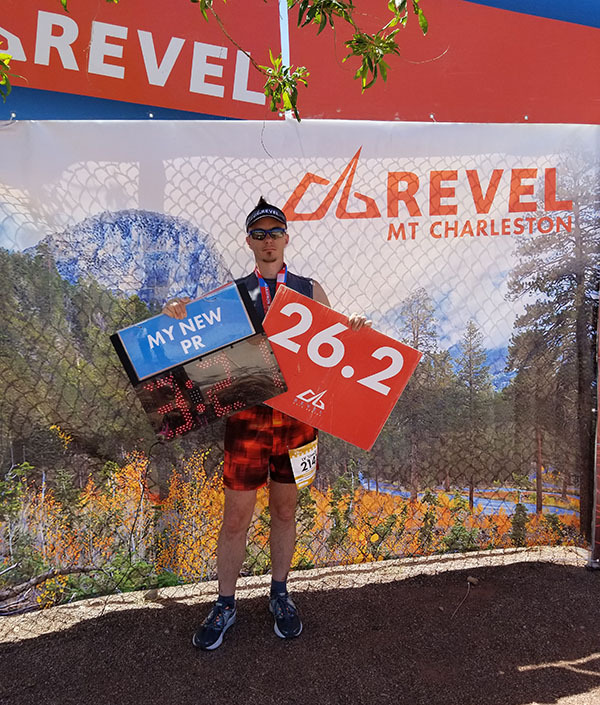 Race Report: Revel Mt Charleston Marathon 2018 - Chris R.
Revel’s Mt Charleston Marathon 2018 was the third time they had held this event. So far, I have ran every year the race has existed, which is a pretty cool streak to have. 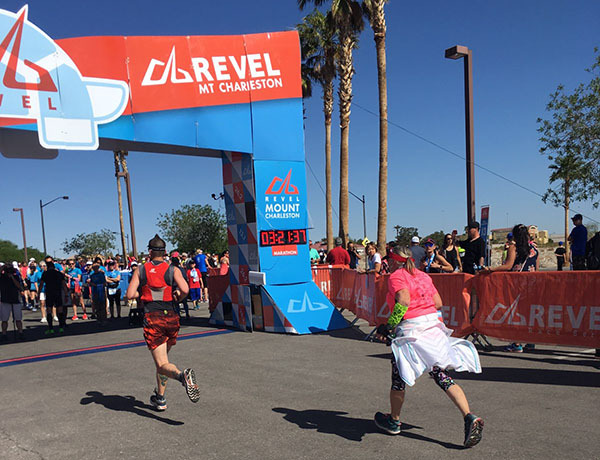 Jet, Em & I arrived in Las Vegas Friday evening, and went straight to the Cox Pavilion to the Revel Mt Charleston Marathon 2018 Race Expo. As always, the Revel team got us in and out of the race bib / packet pick-up portion of the expo. From there, we went across the timing mat, confirmed our bibs were working as needed & picked up our shirts. If I had one “complaint” about the event, it would be the shirts. Previous Revel races have all had some amazing dye sublimation, colorful shirts. Which I wear *all* the time during the right weather. This year, we received plain grey shirts, with a small Revel logo on the chest & an even smaller race mention on the sleeve. I am hoping they get back to having the awesome shirts again! 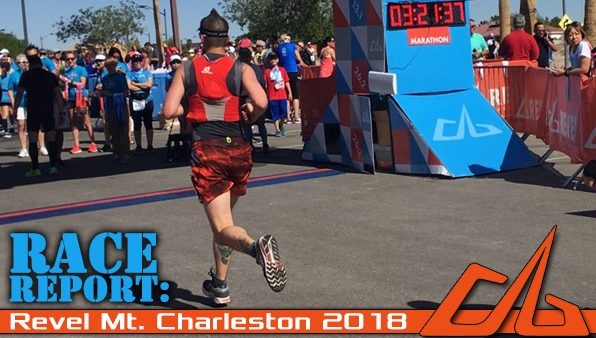 After browsing the expo, trying on some new Altra shoes & making some purchases, we caught up with some friends that were there working the event. From there, we made it to Jet’s Mom’s house, and made sure we were ready for the following day. We made a couple store stops, trying to get the last minute supplies we wanted for race day. We were somewhat successful, as drink flavors for her were found. Energy chews that I wanted were nowhere to be found. Such is life, I would survive, as I had other energy plans, beyond running fasted & eating after the race exclusively. For whatever reason, Em decided she did not want to sleep Friday night. So, the three of us were up for a vast majority of the night, and into the morning. Seemingly as soon as I was able to fall asleep, my alarm went off & it was time to get out of bed to get ready. Fumbling in the dark, I collected my race clothes & headed off to a room where I could turn on a light & get dressed. Once both of us were ready for our races, in the car we went, and headed up to the bus pick-up area. 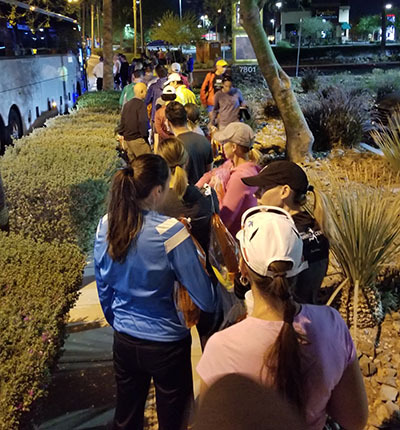 This year, the race organizers hired a parking lot management company to help guide runners to the designated parking areas, while leaving some prime spots open for the complex’s business customers, once they opened. Runners are an interesting bunch. Sometimes, we are herded well, like cattle. Other times, it is like herding cats. For bus loading, it seems to be more of the former. Perhaps the landscaping helped to contain the herd? 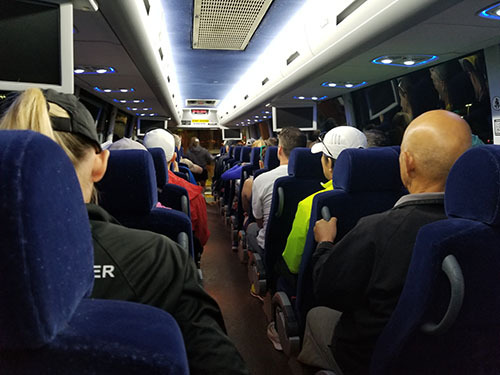 On the bus up, I just tried to rest a little & focus on the plan that Greg Reverdiau of Prescott’s High Altitude Training Institute suggested – “Run fast at the start. Run fast in the middle. Run fast at the end.” Seems pretty straight forward & logical to me. 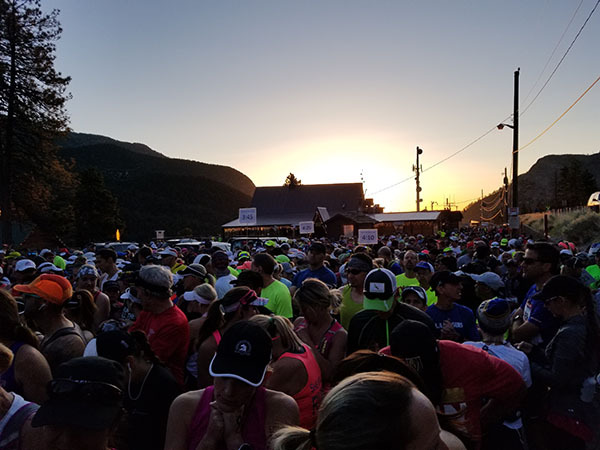 When second guessing one’s sanity in waking up early for so many training runs & for race day itself – having a gorgeous sunrise greet us is always a mood lifting experience. 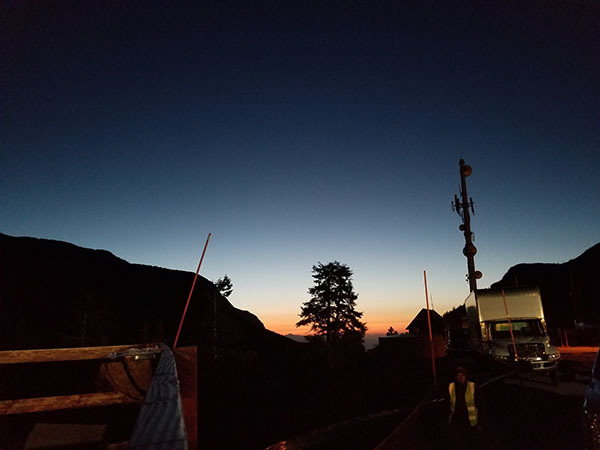 The pre-Mt Charleston marathon sunrises never disappoint. My laziness in capturing it with a Note8 phone camera in auto mode though, that’s on me. 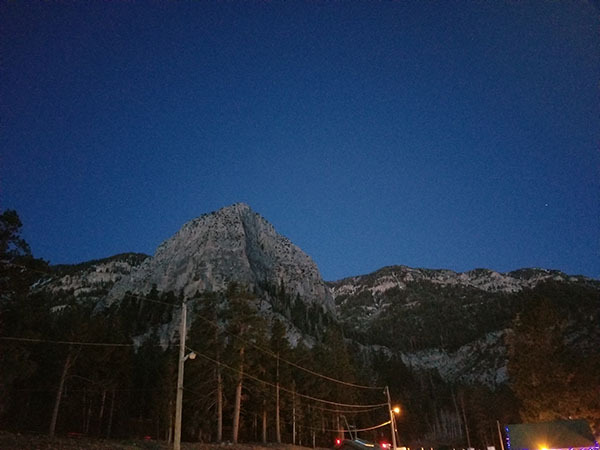 Knowing that a good number of friends would be running the Mt Charleston Marathon again, I started making a circuit through, and around, the Mt Charleston Lodge. With so many runners, it can be tough to spot individuals. As I walked in, a friend from my early days of the Sin City Road Runners run group called my name out & I went over to chat with him some. From there, it was more circuits to try and spot other friends. I was a little successful & managed to find old friends, and finally meet a runner that we have followed each other on social for ages – yet always managed to miss introducing ourselves at other events. Not wanting to waste too many calories circling the Lodge & needing to get a little more race prep done, I made my way outside to a table & bench to get ready. The mountain peak view was a great way to relax, while getting ready. As time to the start approached, I made my way to the gear check truck to drop off my warmer clothes. There, I was able to run into Will Whelan & catch up with him some. 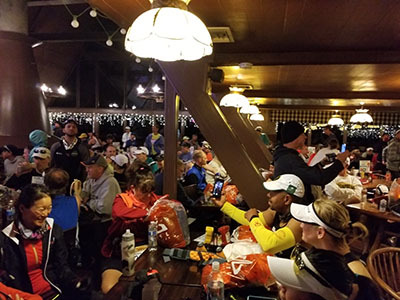 We were, once again, herded – this time more like cats, to the start area. One of the things I think should be a little more organized is the arrangement of pacers throughout the crowd. While a designated wave start should not be necessary – at least putting the pacers in order would seem logical to me. In the start corral, I ended up right next to UltraRunnerSD from Instagram & looked up to see KKapinos – also a runner I follow on Instagram. What an even smaller world it is, now that we can follow & run into people from all over the place, thanks to social media. When the start gun went off, we looped around the parking area, and made our first little climb of the day. I let those who were more ambitious on the climbs take off, while attempting to moderate my pace. The moderation did not last long, as we hit the top of that hill and started our descent! As I love to do, I handed the reins to gravity and told it to bring me down the mountain. That was the last photo I managed to take while running on race day. I was focused on running, rather than documenting. Besides, that’s what the event photographers were for – and they weren’t jostling the camera as they attempted to capture photos. I did become a little sad that Revel decided to nix the top of the mountain photographer. 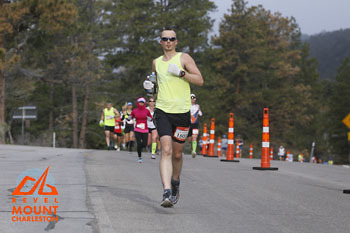 I really liked the image that was captured of me from the first year of the Mt Charleston Marathon. Maybe it was not an intentional omission – perhaps the photographer ran into the same issue that bus drivers at too many events experience… getting lost on the way to their designated location. I don’t think this is the case, as the “photographer ahead” signs were absent this year. It isn’t the end of the world! This race is always so fast. While trying to find that balance between having gravity pulling me down the mountain, and putting some effort into picking up the pace. I did not want to have an empty tank when we hit the less dramatic descent, so I leaned more toward the gravity side of the equation. For a good portion of the first half, I was doing very well. I was ahead of the 3:05 pacer (while she stuck with her group & was not jetting ahead to make use of the portable facilities), while feeling like my effort levels were sustainable. Through the Half Marathon point, I was on a 3 hour marathon pace. Wow! 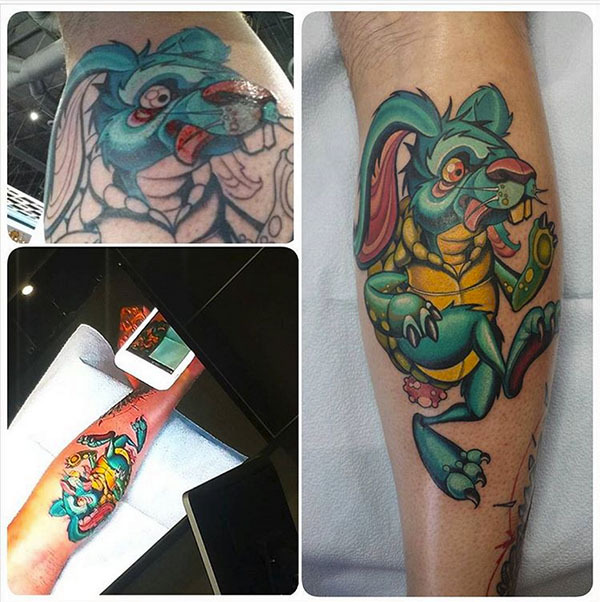 A little beyond the half marathon point, another runner and I started a conversation about my Tortoise Hare tattoo (courtesy of the extremely talented Jason Stephan Tattoo. He mentioned we were holding a 2:58 marathon pace. I tried not to let it get to my head too much. But, would today be the day?! Like clockwork, at mile 16 I had to give in to the intestinal protestations. I was hoping to avoid having to take another multi-minute stop this year, however, my guts had other plans. Fortunately, it was not a prolonged stop. Still though, 4 minutes of leg stoppage does more than just add four minutes to a race. My legs had a chance to cool down & were stuck in a static position for a little bit. I did manage to do as I had in previous years and launch myself back onto the course at a respectably speedy pace. This quick pace did not last, and I settled into a nice, steady pace. 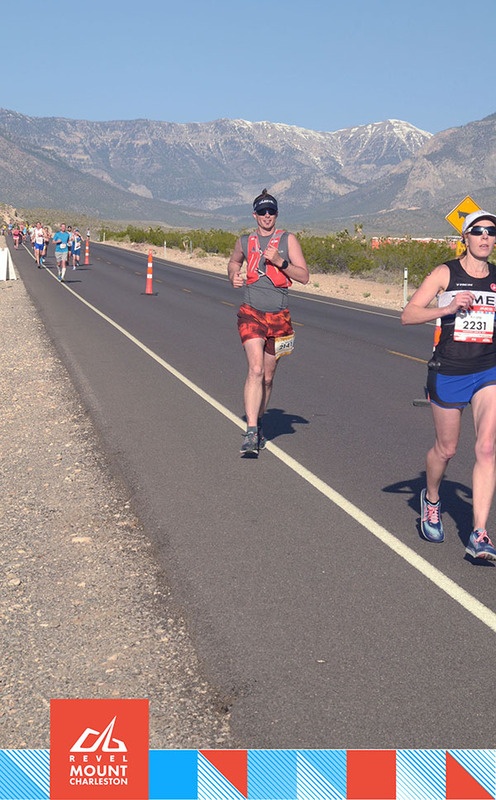 As the miles were behind me, I saw a sub-3 hour marathon falling away. I was OK with it, as I still had a remote chance at holding on for a Boston Qualifying time (I need under 3:10 for my age group). 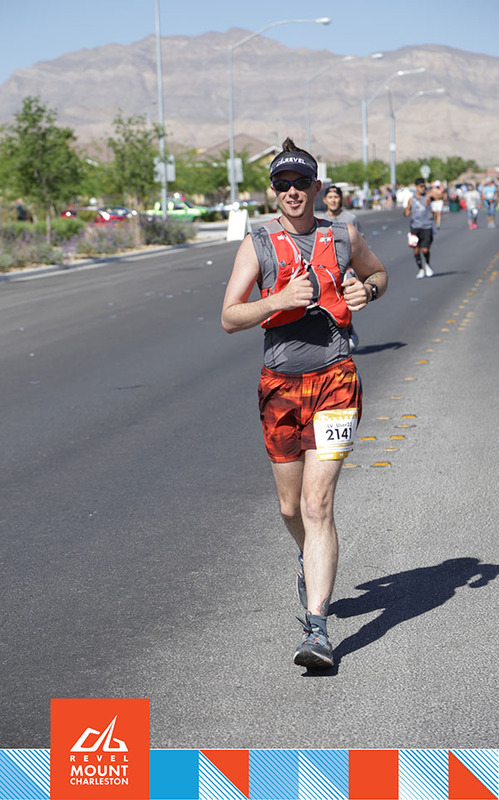 At mile 19, I passed the Desert Dash aid station, spotted some friends (Massey was too busy playing on his phone to say hi – his words, I will give him a hard time, until I get bored with it), and was still moving fairly well. I needed to run faster than 8:02 minute mile averaged over the entire race. I was pretty sure I could walk the rest of the way in, and still get a PR. Walking it in was *not* going to happen though. Well, for a little while any how. It is amazing how quickly I have had my body reverse adaptations from more than two decades of living in the desert. 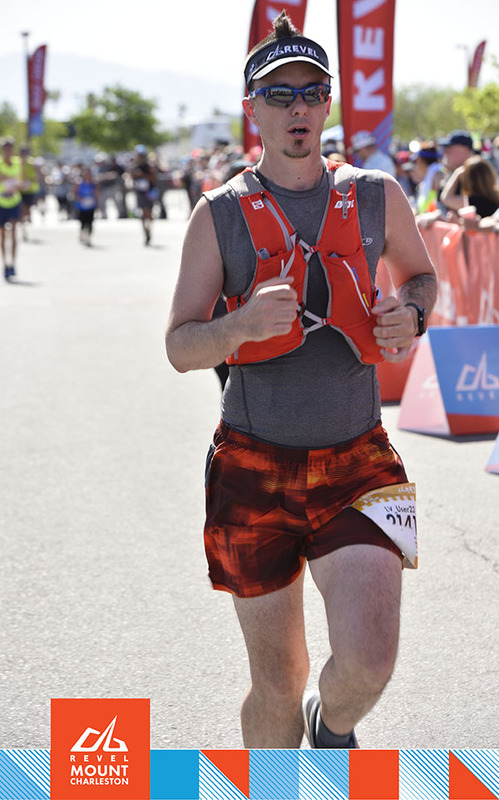 In under two years, the slightly warmer temperatures of the flatter portion of the course slowed me down again. From mile 23 on, I could not stay sub-8 minute mile. 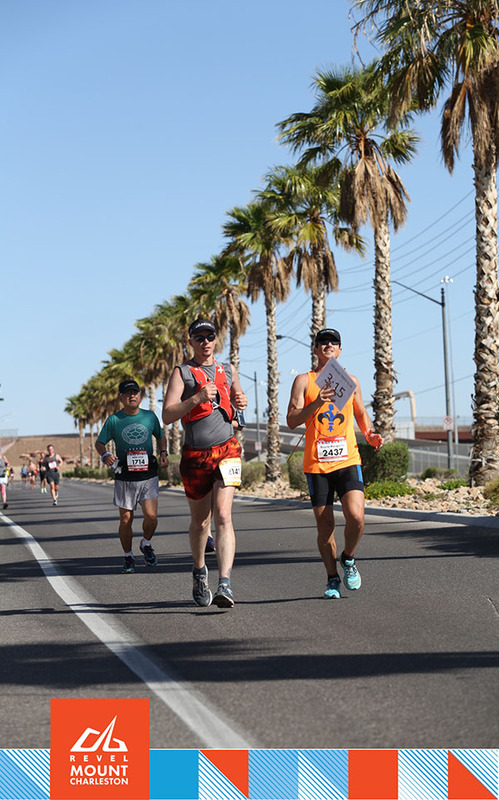 As we hit the flat, palm tree lined section of the course, that took us to mile 23 & that morale killing climb, the 3:15 pacer and I were running together for a short while. I tried to keep up with him for as long as I could, before my will power waned. 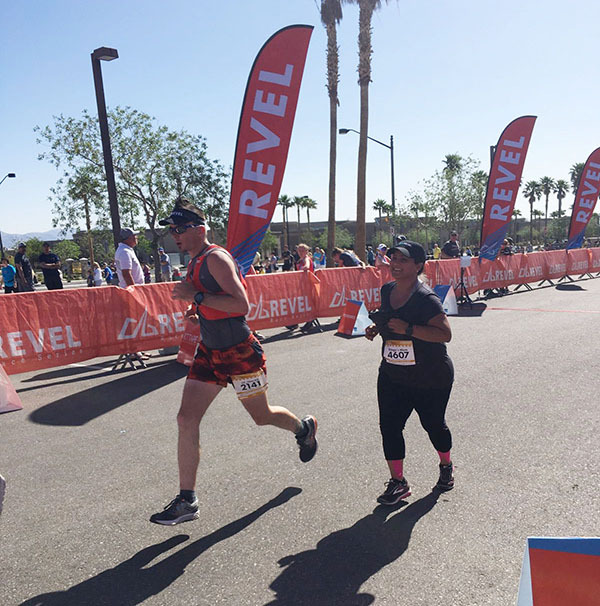 I did my best to limit the walking in a run/walk strategy to a minimum – and as I saw another runner struggling less than a mile out, I tried to pull him along. My motivation worked for both of us, for a short while. He bowed out, and kept with his fight to the finish. My body knew the race was almost over, and found that last push I love so much. 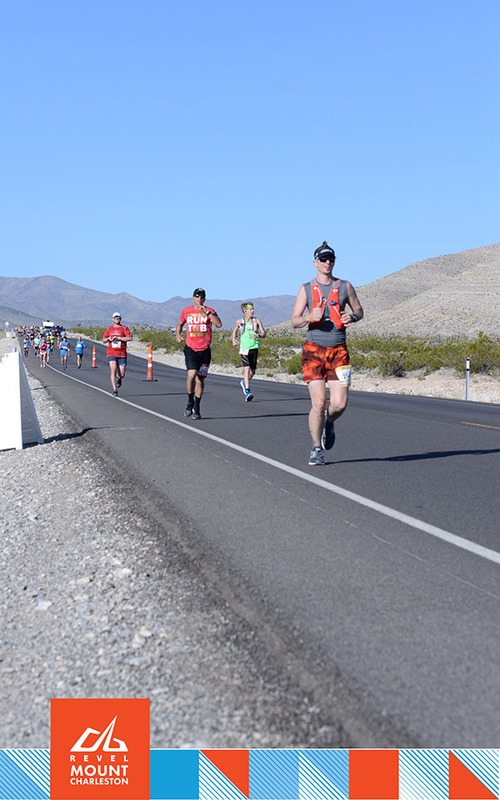 One of my fastest paces of the day was as I ran past the spectators, around the corner, around some half marathon finishers, and across the line for a brand spanking new Personal Best at the Mt Charleston Marathon of 3:21:20.08! Ends up that I finished just behind Jet, by under half a minute! She was there to see me just after I crossed the finish line. 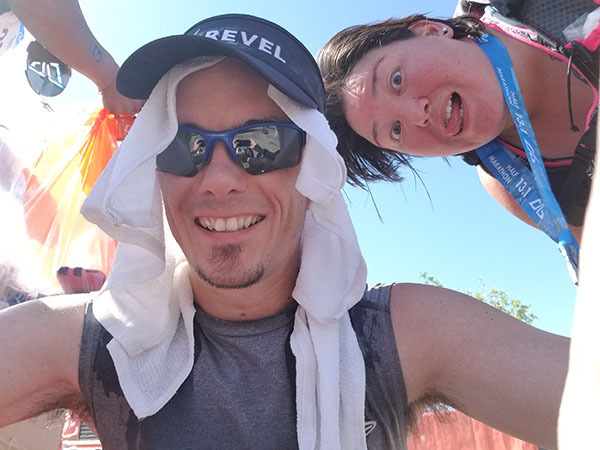 Her and our good friend, fellow Sin City Road Runner, Melissa snagged some chilled/wet towels for me & I sat down to savor the moment. I found out later, she had snapped a few photos of me finishing, too! Those are her shots just above. It looks so cool when you get the “floating” photos. 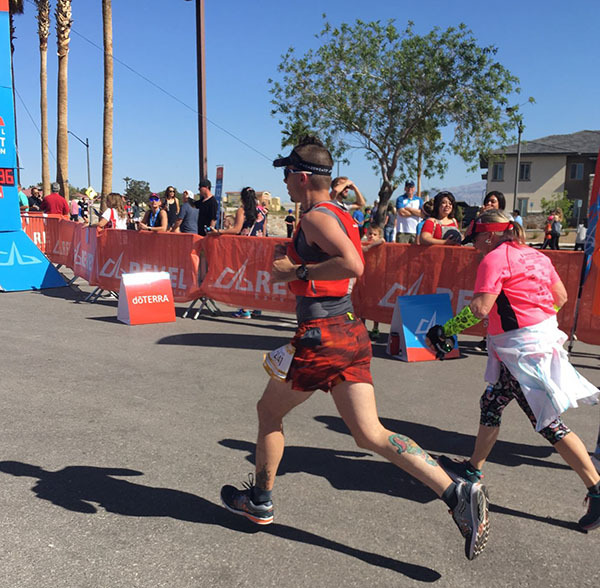 Is it diet, hydration, or something else causing my mile 16 stomach issues? Did a trail 88k two weeks before hurt my chances at a BQ? What can I consume during a race to get a few extra calories for the final push? 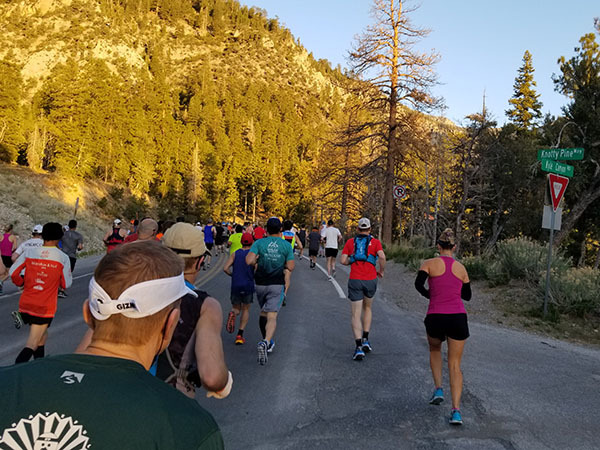 Be the first to comment on "Race Report: Revel Mt Charleston Marathon 2018"